Social media marketing evolved from something only a few cutting-edge brands did to an integral piece of every company’s marketing strategy. It’s no longer a question of whether or not your brand should be on social media, but how can you best use sites like Facebook, Twitter and Instagram to grow your business. If social media marketing hasn’t been working for you, the problem could be you’re focusing on the wrong channels. Set your strategy up for success right out the gate by choosing the best social networks for your brand. The first mistake many brands make is believing they need to be everywhere. Covering as much ground as possible seems like a good idea, but the reality is you’ll likely end up spreading yourself too thin. A better approach is to set your eyes on two or three main social networks, and commit to growing those profiles as much as possible. Before you get started, take our quiz below, to find the network best fit for your brand based on demographic data and the type of content you’d share. You want to make sure you can provide value to each network your join. Signing up for the next hot social network just to have an account is almost useless. Choose social media platforms where you can actively participate and consistently create content. Once you’ve narrowed down your focus networks, click any of the tabs below to find out how to be successful. Most social networks were designed for consumers first and businesses second. As a result, a lot of the functionalities that would make life easier for marketers and agencies aren’t present in native social networking apps. But there are plenty of third-party tools to bridge the gap. First and foremost, every business or agency should have a dedicated social media dashboard such as Sprout Social. 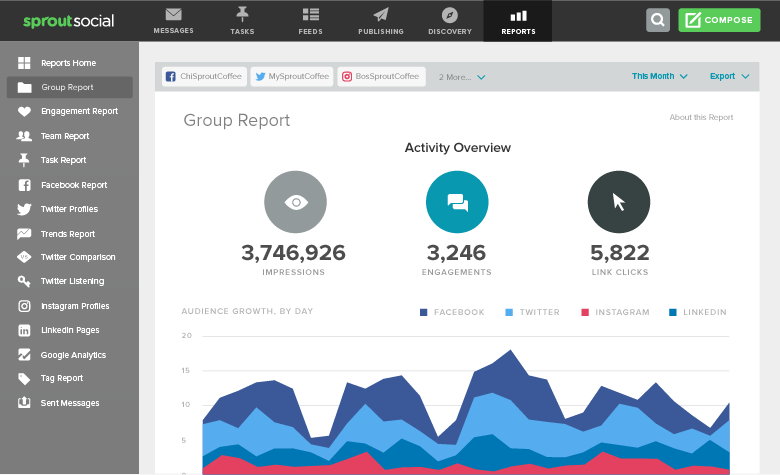 A social media dashboard serves as a “hub” for your social media marketing. Instead of logging into Twitter, Facebook, LinkedIn and other networks, almost everything can be managed in your social media dashboard. 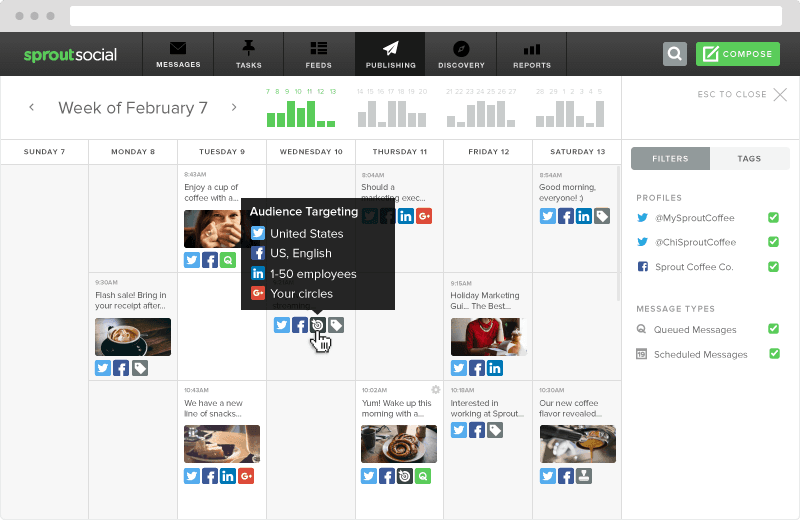 You can schedule and publish content, engage with users and see all of your incoming messages from one location. In addition to publishing, your social media dashboard also gives you reporting features so you can analyze your performance. You’ll get insight into your organic social media marketing such as what content performs best, how well you’re engaging and other important stats to improve your company’s social presence. 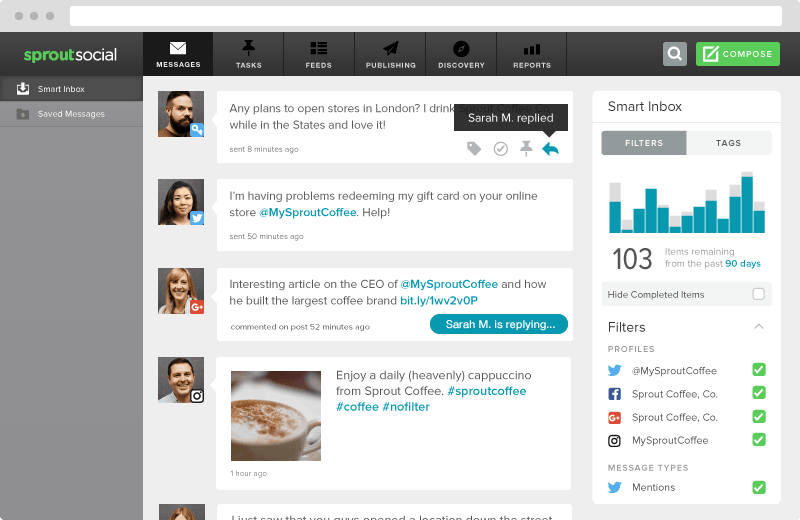 A social media dashboard is also crucial when you need to manage multiple social media profiles. For a small business with a single location, setting up and managing your accounts is pretty simple. However, for businesses with multiple locations, agencies with numerous clients or large enterprise companies with various departments, you’ll likely have multiple Twitter, Facebook and Instagram profiles. 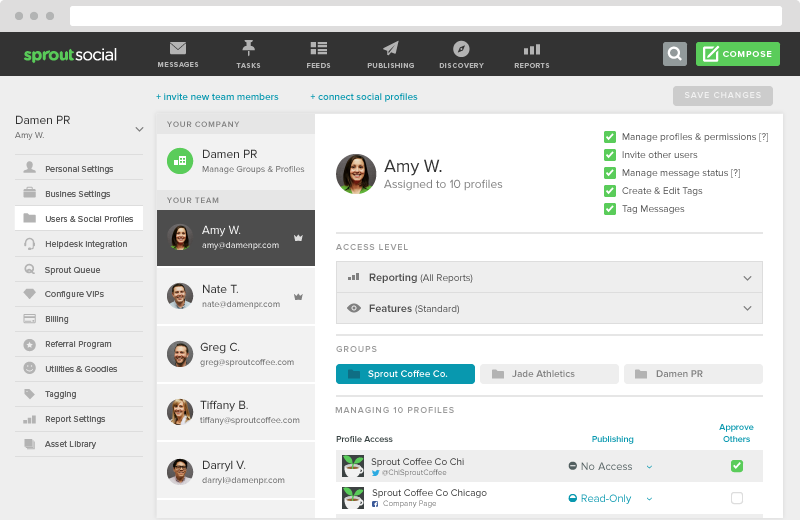 With Sprout, you can easily organize all of your account and profiles into groups, and set access levels on a user-level. Otherwise you’re in for a huge headache trying to juggle multiple profiles with the native social networking apps. 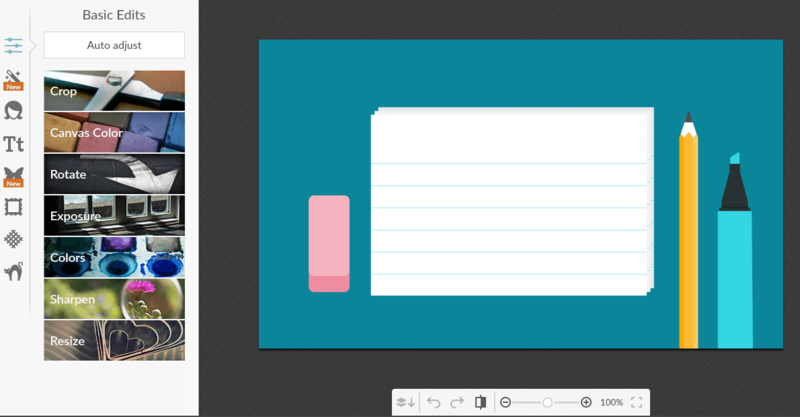 Canva is a free tool that lets you create and edit visuals through a drag-and-drop editor. In addition to its ease of use, one of the key benefits of Canva is its huge library of templates. The templates are sized for specific networks and give you a great starting point. Simply switch out the text and change elements to create completely custom graphics. Or you can create something completely from scratch. Landscape is a social media image resizing tool. When you have an image you want to share across Facebook, Twitter and other platforms, you can’t just upload the exact same picture to each network. You need to resize it to fit each platform’s dimensions. With Landscape you simply upload your image, select your networks and choose your size. The final product is a perfectly-sized photo without being stretched out or too pixelated. If you want to edit your pictures for social media instead of creating new ones, PicMonkey can be very helpful. PicMonkey is an easy-to-use image editing tool for desktop and mobile. Your edits can be as simple as overlaying text on an image or as detailed as manipulating the lighting and color like Instagram filters. Avoid doing too much editing or you could lose the natural appeal of your photo. BuzzSumo is used to find heavily-shared content on social media. Just enter a keyword or website URL and you’ll get a list of relevant blog posts with the most social shares. You can either share these posts directly from BuzzSumo or add them to your social media dashboard to share later. It’s also a great way to get ideas for content to create on your own site. Feedly is a RSS reader that will display the latest articles from the blogs you add. 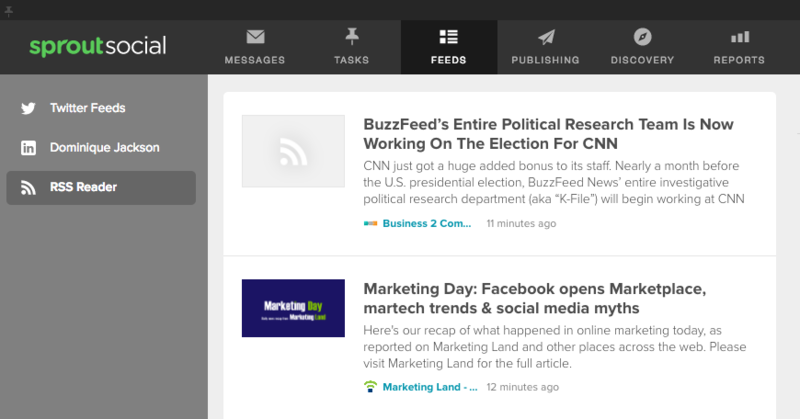 The great thing about Feedly is it integrates with Sprout Social. You can go through all of your different feeds to find the most relevant posts for your audience and schedule them right inside Sprout. Sometimes convincing upper management and the C-Suite that social media marketing is worth the investment can be a challenge. It’s not as simple to track as some outbound tactics like paid ads. And most of the time, the returns aren’t immediate. However, the proof is in the pudding and social media marketing consistently proves to perform as well as or better than traditional marketing tactics. The first step is to help them understand the evolution of the buying process. The need for social media marketing emerged from changes in how consumers shop and engage with brands. The reason social media marketing is a necessity is simple–you need to be where your customers’ attention is. And right now, their attention is on social media. Blogging and social media go together like peanut butter and jelly. Sure you could have them separately, but when you combine them, each complements the other to make it that much better. Social media can be used to promote your blog, and your blog can supply you with content to share on social media. At Sprout, sharing our blog posts on social media helps drive thousands of visitors to our site as well as generate new leads. What Content Works Best on Social? One thing to keep in mind is not every type of content performs well on social media. An article about how your landscaping company won an award probably won’t go viral. But an in-depth guide on how to get your garden ready for the winter has the potential to earn plenty of shares and attention on social media. Once you’ve created your content calendar, use your social media dashboard to schedule your blog posts to be shared on your social media profiles. For more information, check out these blogging tips for marketers. We’ve covered a lot of ground in this guide. Social media marketing is a robust topic that’s constantly evolving so there’s always something new to learn. In addition to the information you’ve received in this guide, below we’ve provided a list of some amazing resources that go in depth on topics to take your social media strategy to the next level. Also make sure to check out our latest posts and subscribe to our newsletter so you don’t miss anything.